Veeam has always been a company passionate about addressing its customers’ needs. In the latest release of NEW Veeam Availability Suite 9.5 Update 4, we continued this trend by meeting an important need for many customers with our NEW native object storage integration: Veeam Cloud Tier. In this blog, we’ll cover the challenges we’re addressing through this new feature — what it is, how it works and the benefits you can take advantage of. You’ll also learn a few points about the uniqueness and innovation built into Veeam Cloud Tier compared to other backup providers. Veeam is changing the data protection game again! One thing is certain about data today — it’s growing exponentially. There are many sources on data growth prediction but there seems to be a consensus that the size of the digital universe will double every two years at least. With this rapid increase of data created by organizations, it’s no surprise that challenges are starting to take hold. Hardware storage costs are skyrocketing, storage capacity planning and management is becoming more difficult, and all the while this resource juggling takes away precious time from core business priorities. Sound familiar? Now, as data begins to reach new highs we’re seeing organizations make a deliberate attempt to manage costs — with many organizations now having a mandate to reduce hardware costs listed as a priority. In addition to the growth, many organizations are having to meet compliance requirements that require they hold onto data for longer and longer periods of time. Investigate affordable storage: The most obvious answer to reducing hardware costs is to adopt a more affordable storage. For organizations looking for long-term data retention with cost-efficiency and scalability there is no better place to look than cloud or on-premises based object storage targets. And this is precisely why Veeam customers have requested native object storage integration. When accessibility and quick recovery are still an integral part of a long-term retention strategy, object storage will make the most sense to meet this need. Take a tiered approach: Choosing a more affordable storage option is half the battle — now you must make sure you are freeing up your local storage in the best, most intelligent way possible. Taking a tiered approach to data management allows you to effectively free up only the storage you want freed up, and tier off only the data you need for longer-term retention. This tiered approach allows an overall better capacity management process. This should ideally be a “set it and forget it” solution that automatically tiers off files to the storage according to your exact retention needs. Veeam Cloud Tier to the rescue! First, it’s important to note that Veeam Cloud Tier is the built-in automatic tiering feature of Veeam’s Scale-out Backup Repository (SoBR) feature. SoBR consists of multiple repositories under one abstracted layer on-premises, that deliver storage efficiencies, enabling the tiered approach to data management I mentioned earlier. What makes Veeam Cloud Tier special is its ability to now make SoBR completely unlimited in terms of its capacity and scale with it now being backed by object storage. Veeam Cloud Tier acts as a capacity tier to automatically offload backups to object storage. One of the most important aspects of Veeam Cloud Tier is its advantage over competitors from a cost perspective. Believe it or not many backup providers will actually “double charge” for the data you store in the cloud. What this means is not only are you paying for the cost of leveraging the cloud provider’s storage but also incurring an additional charge simply for leveraging object storage with their solution. Veeam Cloud Tier is built into our existing Veeam Availability Suite Enterprise and Enterprise Plus editions and you will never see a “cloud tax” fee from Veeam on your bill! Veeam has always been known as a storage agnostic vendor. We want our customers to know that if they work with Veeam they can trust that we deliver protection for any application, any data, in any cloud. Veeam Cloud Tier is no different, you will not be locked into a particular storage vendor, in fact we are proud to offer a variety of storage options mentioned above — including both hyper-scale and S3 compatible on-premises and cloud-based service provider options. This feature also opens up the option for service providers to scale-out their IaaS customers to hyper-scale clouds in addition to leveraging their own clouds. The built-in storage reduction technique is truly what sets Veeam apart from other solutions. We know that customers don’t want to have to send their entire backup to the cloud, or bring it back down for that matter… So, we developed a technique by which the on-premises files remain on-premises as a shell with metadata while the bulk is offloaded to object storage. This drastically reduces the size of the local storage without sacrificing any recoverability of the data. For instance, a 1TB VBK file on local storage could be reduced to a 20MB file. With this lightweight file format customers incur only minimal cloud-based ingest fees for sending data to the cloud. They can also just as easily retrieve data from the cloud without having to recover the entire backup repository through Veeam’s file-based granular recovery options — minimizing egress charges and increasing productivity. It’s clear that massive data growth and compliance requirements continue to take a toll on not only the cost of local storage, but the length of time organizations are required to hold onto data. Object storage is becoming increasingly appealing to many organizations for long-term data retention needs, but leveraging the right solution is imperative to enable a tiered approach to Intelligent Data Management. 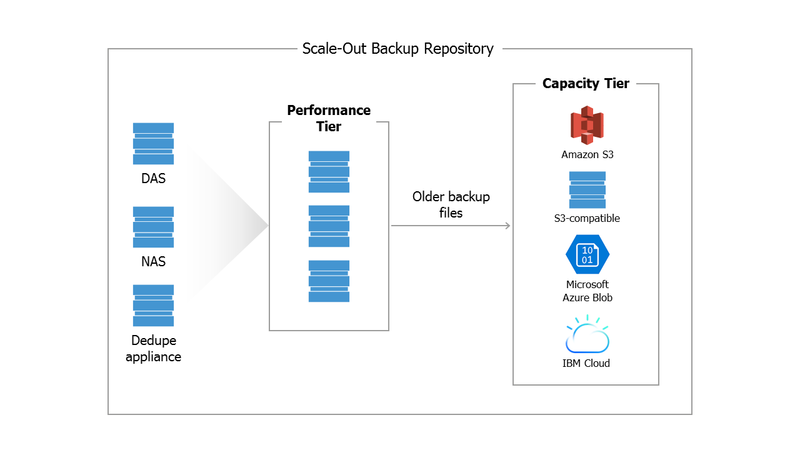 Veeam Cloud Tier provides a simplified approach, enabling customers to natively tier backup files to a variety of cloud and on-premises object storage targets including Amazon S3, Azure Blob Storage, IBM Cloud Object Storage and S3-compatible service providers. In addition, Veeam Cloud Tier has many benefits over other solutions including no “cloud tax” and no vendor lock-in. If you or your customers are not yet leveraging Veeam Availability Suite, now is the absolute perfect time to execute on this tiering strategy to take advantage of the infinite capacity Veeam delivers on object storage. The post Veeam’s NEW native cloud object storage delivers infinite capacity appeared first on Veeam Software Official Blog.